Dopey, dumb and delightfully loopy in all the right ways, Besson’s movie is eye-candy of the highest order. Savant-auteur Luc Besson must have known all too well he wouldn’t have a dry eye in the house during the opening minutes of Valerian and the City of a Thousand Planets. A moving montage details several hundred years’ worth of cordial diplomatic greetings twixt a multitude of interstellar species. Not only is this all presented by the candy-coloured clown they call Besson with his trademark kino-eye of dreamy, fertile, Eurotrash fancy-pants nuttiness, but it’s set to the haunting strains of the late, great David Bowie crooning his immortal ‘Space Oddity’. Can it get better than this? Indeed it does. As we’re wiping away the tears streaming down our collective faces (images of peace accompanied by the voice of a titan none of us imagined dying – ever), Besson slams us into an idyllic world of blue skies and sandy beaches on a planet populated by androgynous, peace-loving pearl divers whose world is unceremoniously (and unexpectedly) destroyed by an intergalactic war that intrudes upon its tranquil shores. 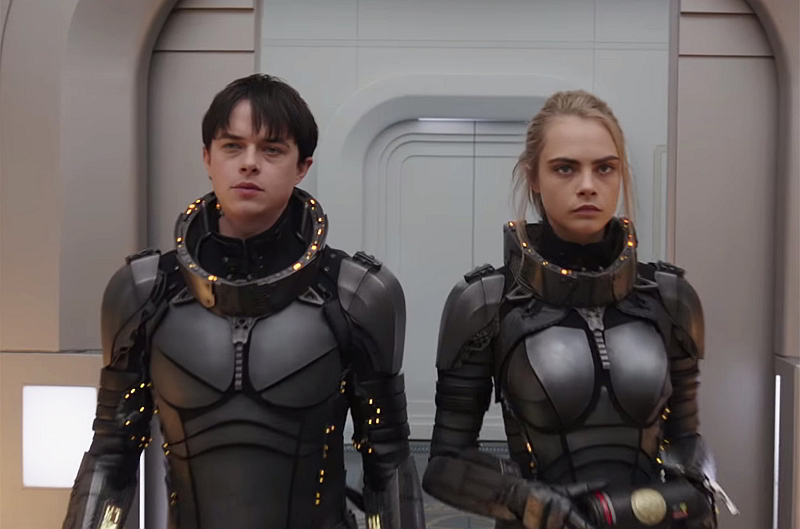 Slam to another idyll: the impossibly gorgeous, endlessly quipping interstellar cops (and lovers) Valerian (Dane DeHaan) and Laureline (Cara Delevingne). It appears as if the hermaphroditic aliens have beamed these images of bucolic bliss followed by planetary devastation directly into Valerian’s mind. He senses this might not be a simple dream, and when he and his partner are plucked for an important mission (ultimately to save the universe), wrongs must (and will) be righted at any cost. At a certain point, the film’s plot becomes unintelligible, but this matters not. Besson’s movie is eye-candy of the highest order. Some might even argue the picture is mindlessly empty. They might be right, but Valerian and the City of a Thousand Planets, based on the ultra-cool and highly influential comic book ‘Valerian and Laureline’ by Pierre Christin and Jean-Claude Mézières, provides a necessary antidote to the stodginess of contemporary American blockbusters. Not only is the picture made by a genuine filmmaker, a pop-artist of the highest order, but it eschews everything that makes studio rollercoaster rides so dull – it’s got a sense of humour that doesn’t seem culled from TV sitcoms (I’m looking at YOU Spider-Man: Homecoming), it’s bereft of dour self-importance (War for the Planet of the Apes, anyone?) and most importantly, though it culls liberally from Fritz Lang’s Metropolis, it does so through the delectable filter of a big, huge series of luminous mouth-blown Dubble Bubble vesicles of Technicolor-like magic. Besides, any movie that features Rihanna engaging in shape-shifting performance art presided over by a deliciously sleazy impresario played by Ethan Hawke, is truly one to be celebrated. This too-brief sequence is so tantalising, one hopes Besson might eventually make an entire picture with these two characters. Yes, it’s safe to say that Valerian and the City of a Thousand Planets is stupid, but it’s dopey, dumb and delightfully loopy in all the right ways.